Villa Songket is the traditional fabric beautifully woven with a mix of metallic and coloured thread. Traditionally reserved exclusively for royalty, today it is more widely worn by many Balinese, particularly for weddings and special ceremonies. This sense of occasion has been reflected in the eclectic, contemporary design of Villa Songket. From customary architecture with all rooms featuring high exposed timber ceilings, open plan living and western comforts and conveniences, to the emerald green Java stone swimming pool bordered by lush tropical garden and relaxing bale pavilion, Villa Songket is the perfect destination for families, friends and honeymoon couples. Villa Songket located in the greater area of Seminyak, the village of Umalas is still traditional and green And allows you to hit the hot spots of Seminyak within a minutes ride. Tucked away along the road you will find Villa Songket. Recently built as designed and wishes from the owners. Songket Villa has 3 bedrooms and carefully decorated with a perfect balance between traditional style and modern comfort. 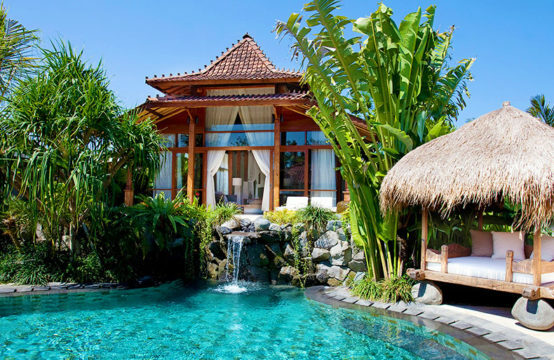 Villa Songket is a unique home in Bali and real home away from home, perfect for families. This large bedroom is separated from the main house by the lotus pond. A generous walk-in wardrobe with dressing table divides the bedroom and tropical open air garden bathroom complete with bath. This room features a king size bed, air conditioning, ceiling fan, cable TV and DVD player, digital safe, a mosquito net over the bed and a writing desk. On the ground level of the main house, this room has all the comforts of the other rooms and its own open style bathroom with garden shower amongst lush tropical plants. This room features a King size bed, air conditioning, ceiling fan, cable TV and DVD player, digital safe, and a mosquito net over the bed. The living room features two traditional Balinese daybeds adorned with Songket covered cushions for the ultimate in relaxed lounging. Recline in comfort and watch cable TV or a movie in surround sound. The solid timber dining table seats 10 and provides grand views of the pool, garden and bale (relaxation pavilion). All bedrooms have air conditioning, ceiling fans and mosquito nets. iPod/iPhone connectivity to stereo system. Well stocked convenience store very close by.